Keep your furry friends busy with this Go Pet Club cat tree. The tall design includes multiple levels for climbing, and two cozy nooks with cat-sized openings offer perches for napping. Plush faux velvet upholstery provides a soft feel, so your cats stay comfortable as they go on about their business. Dangling ropes and toys create playful distractions to occupy your felines, while the CARB certified board construction provides a skin-friendly, environmentally responsible addition to your cat's corner of the home. I have 2 cats and the absolutely love this cat tree. It is tall enough that they can both play and has enough built in toys to keep them entertained. I would definitely recommend this cat tree. I have four cats and they love this cat tree! The hanging toys are holding up exceptionally well even with the hyperactive baby kitty swinging from them. The older cats love to nap in the cabbies. They are giving my furniture a well deserved break. 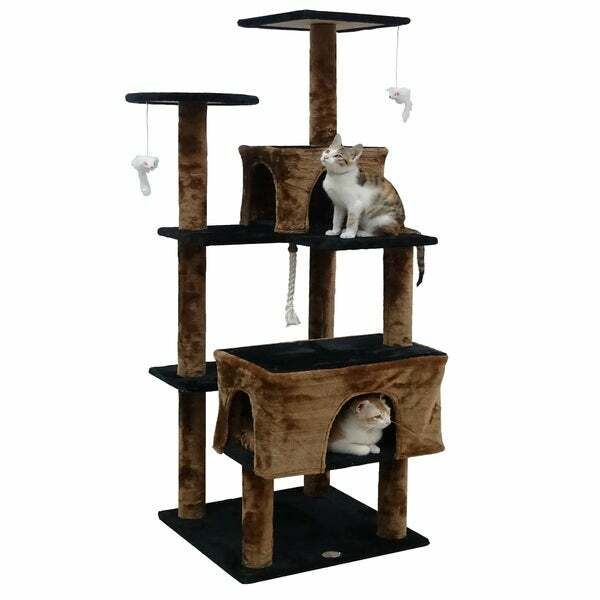 I just got this cat tree house I definitely love the look of it and I love the colors. 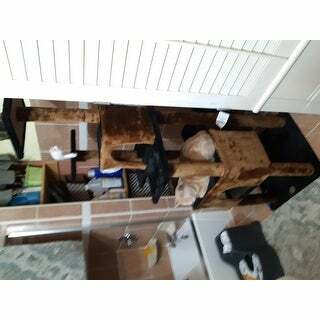 The only things that I am concerned about is when you put both small house and larger house together on it they sort of move around at the bottom they gave you holes only on one part of the cat houses in the bottom but not a whole to go through with a screw to the basis of the cat house or tree house. So even when you put it all together especially the smaller house it's sort of still moves the bottom of it. Hoping that my cats will make use of this of course because it's a taller piece it does not have the best balance so that's always a concern period, otherwise the only other negative is I did not realize that there was no scratch post at all in any of these polls. Maybe I just didn't look at the photo well enough but all of the poles or just the carpet and for some reason I did not realize that. 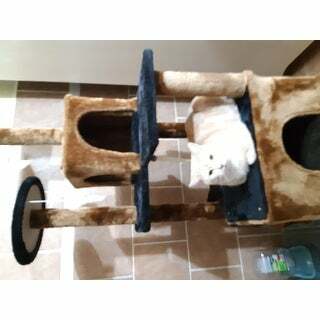 Nice and sturdy, cat loves it! I've had it for four months now, no lifting of the fabric or show of damage, even though the cat tears into it daily. The mice are still firmly attached and haven't shed any of their fluff. This is also super easy to clean with a vacuum. I would highly recommend this to any cat owner. This cat tree was quite easy to assemble and actually looks pretty nice for a cat tree, doesn't stick out like a sore thumb in the room. The cats seem to really enjoy it and so far it hasn't started shedding which is a problem I've had in the past with cheaper trees. Really easy to put together one of my kids put it together. 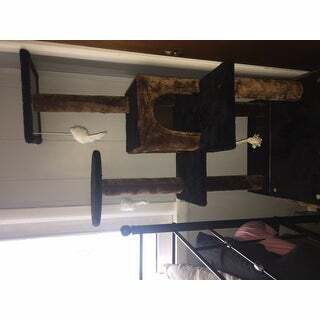 Nice size doesn’t take up too much space not too tall but really works from my house it’s my third cat tree. 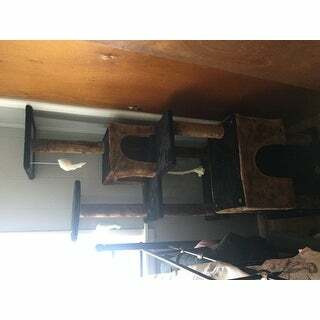 Actually looks cute and I don’t hate it I think a lot of cat trees are ugly. Very useful. My cat instantly fell in love with this cat tree once I finished putting it together. My only qualm is that the fur on the leg posts is really cheaply glued on. It was barely hanging on to the posts when I unwrapped it from the box. I foresee that shortly in the future I will have to re-glue it back on. It does shed some as well. But since my cat is happy, I’m giving it 3 Stars. This condo is so wonderful ... my new kitten took one look at it and climbed right to the top.... she even sleeps inside the squares when she's not sleeping with me ... I can always fine her because if she's not playing on the condo she's playing with the Teepee. my cats just love this! it was very easy to put together. the only thing is a few of my cats are slightly over weight and it wiggles a little when they’re near the top. Perfect measurements and exactly what I wanted and ordered!! Easy to assemble and my cat approved. He is on it everyday. "What are the dimensions of the perches and the hide boxes, pls?" Looks perfect for my two cats!